The Never Compromise Alpha is one of the designs that launched Never Compromise as a serious putter manufacturer. It's a classic big D shaped head with the trademark black and gray straight-line color scheme. Although the design is all rounded curves, the parallel lines of the back of the leading edge and the ridge on the back of the putter give you a really good feeling for where the Alpha is aiming. It's a very pleasant putter to look down on and very easy to align. There are very few putters we've tested at Best-Putter.com which have such a feeling of moving through the ball square to the line. You almost fet the sensation that the putter knows where the line to the hole is! It's superb if you're trying to produce a straight-back-and-through stroke with the face square at all times. 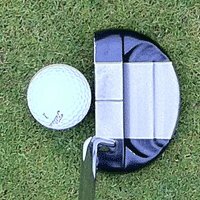 On the other hand if you're a fan of the open-square-closed stroke, with the putter moving more on an arc around your feet, you'll find that this is really not the right putter for you. What about the sensation off the face? Well, I only wish I knew how to describe it! The truth is that the Never Compromise Alpha almost gives you no feedback at all - it's a very very odd, dead sensation. Not to my liking at all. This was one of the Alpha's strengths - I really felt that the putter got the ball rolling nicely and this was also the case on off-centre strikes. All in all very impressive. I was impressed with everything about this putter except the feel of it. The look and the roll is good and it will probably be a good buy on the second hand market as it's been around for a good while.